← Oscar Isaac Wants to Play Snake in Metal Gear Solid Movie. Who Else Should Star? Seriously, what the hell is this team?? Last week, everyone (myself included) was doing their best Chicken Little impression when talking about the Celtics, and now the media is acting like they are the King of the East this morning after taking out Golden State last night. Yes, the Celtics did beat the Warriors in their own area by 33 points last night, which was the worst defeat Golden State has ever suffered at home in the Steve Kerr era. Gordon Hayward also had his best performance of the season – 30 PTS, 7 REB, and 4 AST on 12-of-16 shooting – and Jaylen Brown continued to be a force off the bench. All 13 guys who played for the C’s finished with a plus rating, and the team overall finished with 38 assists (including 11 from Kyrie) on 49 made shots. They actually played like a TEAM last night, which should be the game’s biggest takeaway. There were also no post-game blowups or bitchy comments. Brad did not seem exasperated after the game. And again, we beat the two-time reigning champs by over 30 on their home floor. It’s OK to be happy about this one. BUT don’t be fooled into thinking this team is definitely “back.” Right off the top, it’s important to note that the Warriors were playing without Klay Thompson last night. Steph Curry and Kevin Durant also sat out the entire fourth quarter (sure, the game was already well out of hand at this point, but still). Also, the Warriors are reeling a bit right now, losing 5-of-their-last-8 games; the Celtics may have very well caught them at the perfect time. It also helps when you shoot over 50 percent from the floor, and your opponent barely cracks 40. Above all, there is also one glaring issue with this team right now that is being overlooked, and it is one that still remained true even during last night’s big win: free throw attempts. The Celtics are shooting the second least amount of free throws per game this season (19.2), and last night three starters failed to attempt even ONE. Overall, the team shot 17, while Golden State had 23. We haven’t really seen a whole lot of this in 2018-19. I am not saying there is a direct correlation between success and free-throw attempts; while teams like Orlando, Cleveland, and Chicago all rank near the bottom of the league in this category with the Celtics, others like Indiana, San Antonio, Denver, and Golden State are also in the bottom-eight. The Celtics have also been able to overcome a lack of volume at the charity stripe by shooting the sixth-most three-pointers in the league and converting over 36 percent of them. Fine. But it still illustrates the team’s lack of aggressiveness much of the time, as it is much easier to settle for a three than it is to take the reigns and drive it to the bucket. With guys like Kyrie, Jayson Tatum, Jaylen Brown, Terry Rozier – all of whom have great slashing ability – it’s a bit frustrating to see them pass up some easy opportunities. It also speaks to the overall psyche of the team right now as well as the fact that we still aren’t exactly sure who wants to be THE top dog behind Kyrie. The time is now, Gordon! Carpe diem! So, it’s not so much the lack of free throws, per se, but rather it’s the lack of cajones – from both the players and coaching staff alike – that has held this team back. Nobody wants to be the man to step up and do what needs to be done to right the ship. 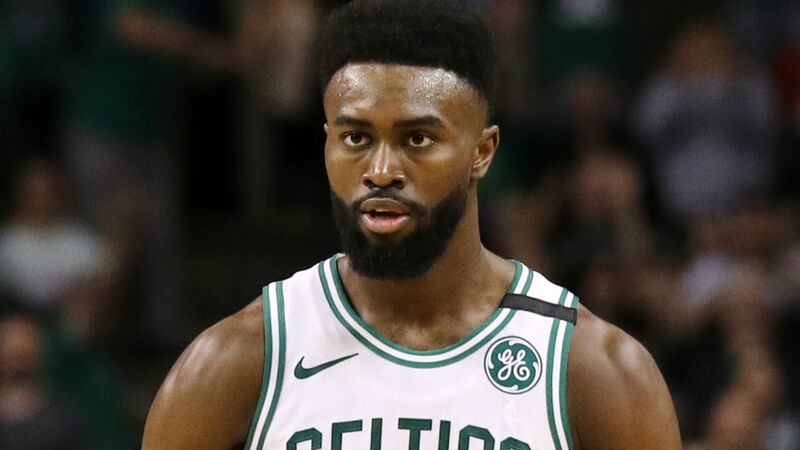 Jaylen Brown needs to be starting again. After being bumped up to the starting five around Thanksgiving, Marcus Morris was on fire during the month of December. Since this time, he’s been mediocre to outright bad (which included putting up a GOOSE EGG in 17 minutes against Houston on Sunday). Brown, however, is shooting over 46 percent from the floor in his past five games and just looks like he wants it out there. The young fella could provide this team with the energy and spark it needs to get out of their funk. The kid is locked in right now. Morris then needs to battle Gordon Hayward to be the sixth man. Bench scoring has been a huge issue on this team, but one of these guys needs to step up and solidify themselves as the consistent top dog off the pine. Brad needs to keep tightening the rotation, giving the minutes to those who show that they actually want to play and burying those that don’t. It’s March, the playoffs are right around the corner, and it’s time for the men to be separated from the boys. So, there was definitely a lot to like from last night, but this team still has a ways to go. The Celts have another sneaky tough contest tonight in Sacramento and aren’t home again until next Thursday night. Here’s to hoping the boys can keep it up! This entry was posted in Celtics, NBA and tagged Boston Celtics, Boston Celtics Golden State Warriors, Celtics, Celtics Beat Warriors, Celtics Warriors, Celts, Gordon Hayward, Jaylen Brown, Kyrie Irving, NBA. Bookmark the permalink.